Currently, we are witnessing the emergence of computer-controlled output devices that provide revolutionary possibilities for fabricating complex, functional, multi-material objects with stunning optical and mechanical properties that cannot be manufactured using any other method. Access to 3D printers is becoming ubiquitous through affordable 3D printers and online 3D printing services, accelerating the growth of a vibrant maker community. Leveraging the potential of this technology requires efficient methods for content creation. In recent years, computer graphics researchers have contributed significantly in developing novel computational tools for 3D printing. Various methods have been presented concurrently for designing objects with functional goals, hence a coherent analysis and discussion is missing. This course starts by reviewing current state-of-the-art 3D printing hardware and software pipelines and analyzes their potential as well as shortcomings. The course then focuses on computational specification to fabrication methods, which allow designing or computing an object's shape and material composition from a functional description. These approaches are grouped into two categories, automatic methods without user interaction and interactive methods that keep the designer in the loop. We review automatic methods for translating functional specifications such as appearance and mechanical properties into functional material compositions that can be 3D printed, providing a coherent view of the underlying data structures, inverse problem formulations, and optimization strategies. 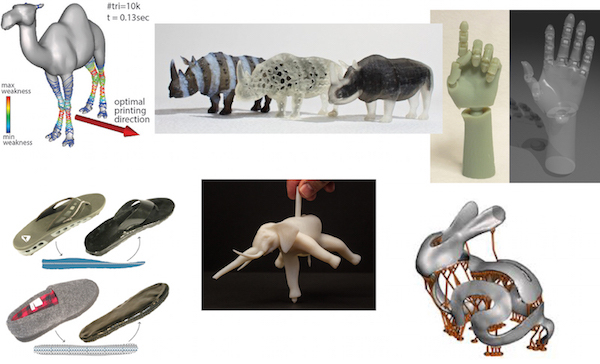 We then describe recent efforts in interactive design and simulation methods for 3D printing. A central focus will be on applications of interactive methods during the design process for stability enforcement. Furthermore, we will provide a general introduction to interactive personal fabrication methods and compare the underlying principles by analyzing use cases for airplane, furniture, and cloth design. This course aims to fit two major purposes. First, present a coherent review, common theory, and understanding of specification to fabrication methods, and providing insights on current limitations on the software and hardware side that may inspire future work. Second, connect with the maker community and industry, making recent research efforts more accessible.